German physician; born at Xions, Posen, May 26, 1820; died at Berlin June 15, 1900. He received his diploma as doctor of medicine from the University of Berlin in 1844, and settled as a physician in Gnesen, where in 1850 he was appointed "Kreisphysikus" (physician to the board of health). In the following year he moved to Berlin, where he continued to practise till his death. In 1854 Kristeller founded the Berliner Aerztliche Unterstützungskasse, a benevolent mutual society for physicians, which in 1879 became the Wilhelm-Augusta-Stiftung. He opened a private gynecological hospital in 1855; and in 1860 he was admitted to the medical faculty of Berlin University as privat-docent in gynecology. In 1866 Kristeller became physician (unsalaried) to the poor. As chief surgeon of a hospital he took an active part in the Prussian wars of 1866 and 1870-71; in 1867 he received the title of "Sanitätsrath," and in 1873 that of "Geheimers Sanitätsrath." He was one of the founders of the Medical and Gynecological Society of Berlin. Kristeller took an active part in Jewish communal affairs. He was a member of the Deutsch-Israelitische Gemeindebund, being president of the executive committee to which he belonged from 1882; he was a member of the executive committee also of the Society for Propagation of Handicrafts Among the Jews, and belonged to a society for the help of Rumanian and Russian Jews. 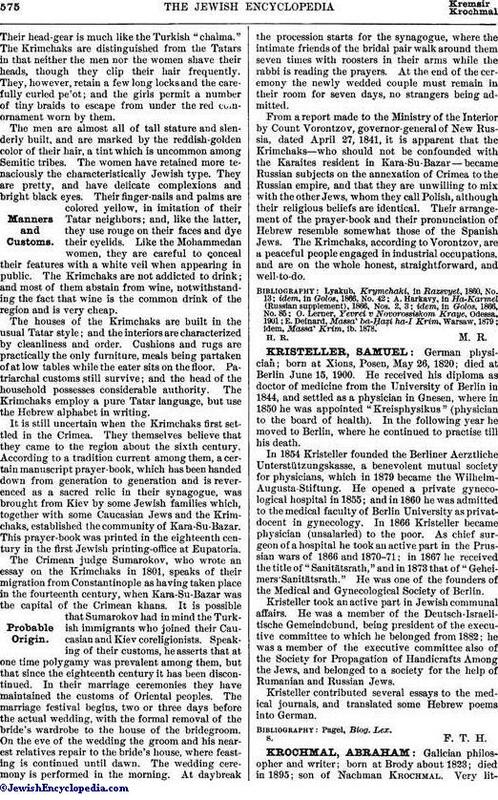 Kristeller contributed several essays to the medical journals, and translated some Hebrew poems into German.